Back in June, the U.S. Food and Drug Administration (FDA) issued a request for Endo Pharmaceuticals to remove Opana ER from the market, citing concerns that the opioid drug’s potential for abuse and misuse far outweighed its benefit. Officials also said that previous efforts to reform the drugs just changed the way that consumers abused it, which may have led to serious outbreaks of HIV and hepatitis C. Now, faced with the prospect of losing the drug’s approved status anyway, Endo has announced that it will be acquiescing to the withdrawal request. “After careful consideration and consultation with the FDA following the FDA's June 2017 withdrawal request, the Company has decided to voluntarily remove OPANA ER from the market,” the company said in a press release. In its announcement, Endo said that it will work with the FDA to coordinate and remove the drug in a way that will “minimize treatment disruption for patients” and allow “patients sufficient time to seek guidance from their healthcare professionals.” Additionally, the company says that it expects to incur a pre-tax impairment charge of around $20 million in the second quarter to write off any remaining net book value for Opana ER. 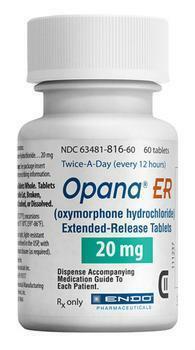 Company officials reaffirmed that neither the FDA’s request or Endo’s decision to remove Opana ER from the market indicates that the drug is unsafe. “Endo International plc…continues to believe in the safety, efficacy, and favorable benefit-risk profile of OPANA ER (oxymorphone hydrochloride extended release) when used as intended, and notes that the Company has taken significant steps over the years to combat misuse and abuse,” the company said.